The Tango has always been considered a dance originating in the borderlands between Uruguay and Argentina in the 19th century. But today we know that the first to tango were the Vikings, and that they brought the dance to these remote southern shores many years earlier, when they accidentally took a wrong turn in the middle of the Atlantic and landed on the east coast of South America. But that’s a story for another label….. Many today think of it as a glorious adventure when Viking sailors went on a rampage in historic times. But in reality it was just an incredibly long and boring sea journey in the company of only other sweaty and smelly males. On one particularly long journey on the way to Tahiti, Viking Captain Sigvaldi Sigehelmsson had become aware of the declining morale among his longboat crew, so he ordered a captured local slave to entertain the bored warriors. And by a strike of Odin’s luck it turned out that the slave had been a dance instructor in his civilian life before pursuing a career as a slave. Atangoere was his name, meaning “he who liked men too much and danced when he should be working”. The charming young slave soon taught the sturdy Danish sailors tricks about eyeliners, lipsticks and colorful mascaras. And also how dancing cheek to cheek could make the whole mood of the ship sexier and brighter. Captain Sigehelmsson was thrilled with what he saw, and as a leading officer in the Viking Naval Command he ordered dancing to be compulsory on all Viking ships when more than two days at sea. 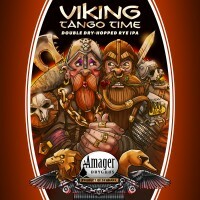 And in honor of their first instructor Atangoere, the Viking command named the dance “Tango”. And this, dear readers, is the reason why to this day Scandinavian men are the most sensual dancers in the world. It’s a simple matter of their Viking genes. This is a collaboration beer made with Kings County Brewers Collective (KCBC), Brooklyn, NY, USA.